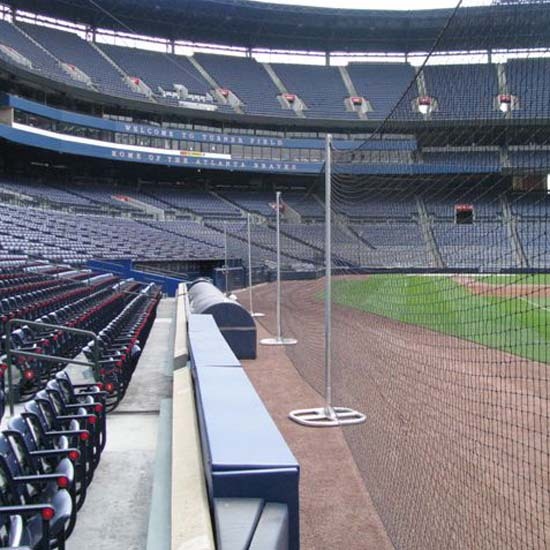 Portable barrier netting to protect spectators, players, and children from foul balls. This versatile net system can be set up in minutes with no damage to the field. No digging or heavy equipment. The lightweight aluminum bases and poles are designed for portability and easy setup. Net height available in: 6′, 8′, 10′, and 12′. Netting system is priced per linear foot with minimum order of 25′. Pole spacing is recommended at no more than 25 apart. Vertical posts sleeves into base for quick setup and break-down. Turn corners to protect edges of fields, or zig-zag net layout as needed. 25′ increment orders include: aluminum support poles and bases @ 25′. Example: 100′ order includes (5) poles and bases, and (4) 25′ nets. Custom designs and sizes available. Additional support posts and bases can be ordered separately. Call for details.